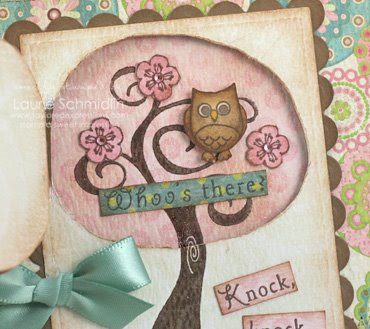 When I sat down to make this card, I kept looking at the cuuuuuute owl (I just love his sweet face! 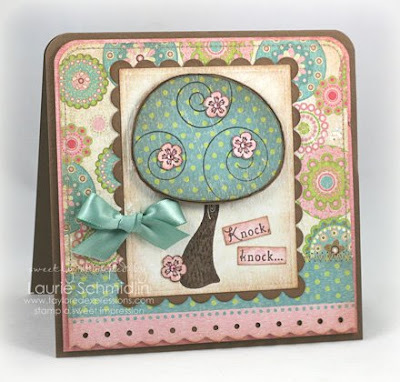 ), and the idea for this card (beyond the knock, knock part) hit me! I embossed the tree trunk and paper pieced the swirly top (from the Branching Out set) with the My Mind's Eye paper that is included in the Easter Key Ingredients Kit. I then cut around part of the tree top so that it would open....yes, you guessed it...to reveal that sweet owl (from the Branching Out Coordinates)! I used the little flower from the Branching Out Coordinates set to decorate the outside as well as the inside, complete with rhinestone centers (I used the mini rhinestones from Taylor's Tiny Twinkles). I hope I was able to bring a smile to your face today! Accccckkkkk!! How awesome is THIS?! Your card is beautiful, and the details are perfection! Great way to use this awesome set - TFS! And Laurie, the knock-knock thing might last a while. My son is now eight and still going strong. I've rolled my eyes so much it's a wonder they're not stuck by now - LOL! Laurie- You are just too clever. Love, Love the card!! My boys would love this card and Amy theht the Knock Knock thing doesn't ever end. My brother in law still does Knock Knock jokes and he is like 45. The best vacation day we had was fueled by a book of Knock, Knock Jokes. Thanks for sharing your projects with us. You are such an enabler...now I NEED THIS SET!! Laurie, this is beautiful! I love all the different DP that you used...it's so pretty together! Laurie - if I've told you once, I've told you a million times to give me a little warning next time you plan to knock my socks off - okay? Loved your card and that yummy DP! Oh my gosh...so cute!! Love those pretty papers too!! Oh My Goodness! How cute is this?! Wow...the colors and that adorable owl...not to mention that the tree top flips open! This is fantastic Laurie! So clever, creative and STUNNING!! What a fabulous idea! And gorgeous to boot! Love the papers and all your *Laurie* touches! You ROCK my friend!! Laurie, this is just gorgeous! Oh my gosh, you totally ROCK!! What an incredibly clever idea! What an awesome card! I love how the tree opens and there is a little owl inside! Fabulous! Can't stop looking at this. It is beyond gorgeous! Wow Laurie!! What an awesome and creative idea!!! Love your whole card!! Love how it opens to reveal the owl!! My 6 year old daughter loves the knock knock jokes too! I agree with Gabi - you blew our socks off with this one! SMIIIIIIILE!! yes - you brought a BIG one to my face! I adore this and ever since seeing this set have been wondering HOW to incorporate the saying---now I know! you're so clever. I'll make one for my niece some day, I bet she will LOVE it. TFS! How creative!! I'm sure your son loves this adorable card! OH CUTE!!!! This card is just adorable!!! Love that stamp set!! Just fabulous Laurie. I love the DP`s and stamp set together. I`m sure you son fell in love with it at first glance! Oh, just so stinking cute - LOVE IT!!! What an amazing card, Laurie! So cute and clever! How cute! What an amazing way to use the set! What an adorable card! Love the way you "opened" the tree! You do great work! How Awesome and adorable Lauri!!! How do you ever come up with all the cute ideas!! Love it!! Your card is WAY too cute! I LOVE how it opens up to reveal the owl. What a great idea! It is something impossible! :) Yes, fantastic, ideal and nice very much, congratulations! Eeeeeeks...this is SUPER cute! What a clever idea to put the owl inside the tree.